I was damned lucky to find this one. I was just passing, which when we're talking about a backroad in West Wickham is highly unlikely. It's not often open, only Wednesdays to Fridays, plus the first and last Saturdays of the month. And it only opened a month ago, following a major (and very welcome) upgrade of facilities. 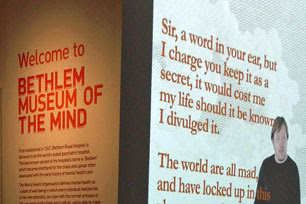 So I was well pleased to have the opportunity to explore London's latest museum, and to discover more about the uncomfortable history of mental health. Bethlem used to be Bedlam, London's most infamous asylum, before changing its name and moving to the suburbs. Now its art deco admin block has been transformed into a museum and gallery, the emphasis very much on expression and emotion rather than stark history. Downstairs is the art, with the opening exhibition focusing on former and current patients and their work. George invites visitors to rearrange his artefacts and tweet a photo, which he might paint, while Albert was busy in the back room constructing another of his architectural drawings. It's illuminating to read the artists' blurb when their thought processes make a genuine difference, the outcome often more therapeutic than celebratory. A larger gallery upstairs currently hosts the work of a single artist, Bryan Charnley, whose schizophrenia informed his paintings and a haunting series of pre-suicidal self-portraits. But the main act is the museum proper in the upper east wing, where visitors are invited to confront their prejudices and expand their minds. Here shackles and an ECT machine sit alongside psychological apparatus and a display of inkblots, while an outer chamber houses flaking panels from a padded cell. More positive interactions are also emphasised, with archives to explore and an interactive video or two (so, would you send Lauren home on weekend leave?). It's all so very well done, and it's clear from the visitors book that many of the first month's attendees have found this a helpfully spiritual experience. I stayed 40 minutes, this without an additional stop at the hospital restaurant for refreshment. You might want to wait for the annual Sunfayre and Open Day, usually at the start of July, for the broader Bethlem experience. But if you're ever just passing, and the museum's actually open, I'd highly recommend a visit.